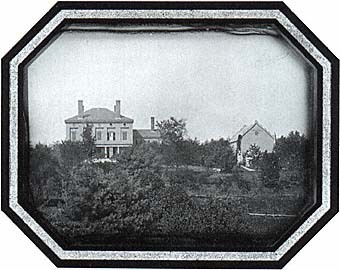 Taken over 130 years ago, this rare whole-plate daguerreotype depicts a Classical Revival home designed by the Worcester architect-builder Elias Carter (1781-1864). Although the barn, grounds, and orchard no longer exist, the house, built in 1838 for Stephen Salisbury II (1798-1884)- father of the Museum's founder- still stands on present-day Harvard Street. With wood construction simulating stonework and a porch supported by Doric columns, the house is an imposing example of the latest architectural taste of its day. This landscape view represents the less common use of a popular medium employed primarily for taking studio portraits in the mid-nineteenth century. The photographic process, which produced a direct-positive image from nature by optical and chemical means on a sensitized silvered plate, was introduced to the United States by Samuel F. B. Morse (q.v.) and Dr. John W. Draper, professors at the University of the City of New York, soon after the French artist Louis Jacques Mandé Daguerre announced his invention to the world in 1839.